Find Chapters and Butchers - Farmers and Hunters Feeding the Hungry - Hunt Down Hunger! Our volunteer chapter coordinators are motivated by an authentic desire to help others, and are committed to being an active part of the solution to hunger. Donate deer, elk and livestock free of charge to any of the inspected, approved meat processors that participate with the FHFH program. To open the map below in a new window CLICK HERE. Many states have additional organizations that invite hunters to help feed the hungry. 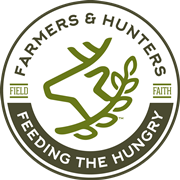 Together with FHFH, these groups represent an entire movement of hunters playing a vital role in hunger relief across America! CLICK HERE for links to other venison donation programs.